Online insurance exchange MarketScout just reported that the composite rate for U.S. commercial property/casualty insurance declined by 4 percent in December 2015. No line of business tracked by MarketScout saw a rate increase compared to the same month the previous year. Its analysis was accompanied by some interesting commentary on the market by Richard Kerr, MarketScout CEO. It may seem like the insurance industry has already been in a prolonged soft market cycle, but we are actually only four months in, Kerr noted. MarketScout has been tracking the U.S. p/c market since July 2001 and Kerr also made the point that the length and veracity of the market cycles seems to have become less volatile in the last five or six years. As a result, the impact of hard or soft market in today’s environment may be 5 or 6 percent up or down, he said. Kerr observed that underwriters today have better tools to price their products and forecast losses. Further, the chances of a rogue underwriter or company are greatly reduced by the industries’ checks and balances, Kerr said. MarketScout’s historical barometer shows a mean average rate increase of 30 percent in calendar year 2002 and a mean average decrease of 13 percent in calendar year 2007. The current environment is relatively benign in relation to these volatile years, MarketScout observed. I.I.I. provides commentary on the p/c insurance industry financial results here. Business interruption, commercial property, general liability, umbrella, and workers’ compensation were the lines brokers most often noted had a decline in rates in the third quarter of 2015, according to the latest Commercial P/C Market Index Survey from the Council of Insurance Agents & Brokers. Broker comments came as The Council survey found rates decreased across all lines by an average of 3.1 percent in the third quarter, compared with a 3.3 percent decline in the second quarter of 2015. Large accounts saw the largest decreases at 4.1 percent, followed by medium-sized accounts at 3.8 percent, and small accounts at 1.4 percent. The ongoing buyers’ market was consistent across most lines of business, The Council noted, with a few exceptions, including commercial auto and flood both of which saw a slight uptick in rates. Flood continued to be viewed as a troubled peril, brokers said. Flood insurance rates increased, especially in the Southeast and Pacific Northwest regions, as rate increases, assessments and surcharges continued to be implemented by the National Flood Insurance Program (NFIP) and Write Your Own Carriers. Ken Crerar, president and CEO of The Council observed that while rates seemed stable and competition plentiful, the brokerage industry is keeping an eye on many factors that may have an impact on insurance placements going forward. We heard from our brokers about the growing cyber insurance market, consolidation in the industry, and attracting and retaining talent. Check out latest I.I.I. information on industry financial results here. Where is the Insurance Float? Insurance Information Institute (I.I.I.) chief actuary James Lynch explains how insurance float works and the impact it has on insurance rates. He is talking about premium and loss reserves, the funds that any insurer holds while waiting for claims to settle. That money gets invested, and the investment income is an important revenue source for insurers. It also lowers insurance premiums, since actuaries take investment income into account when setting prices. 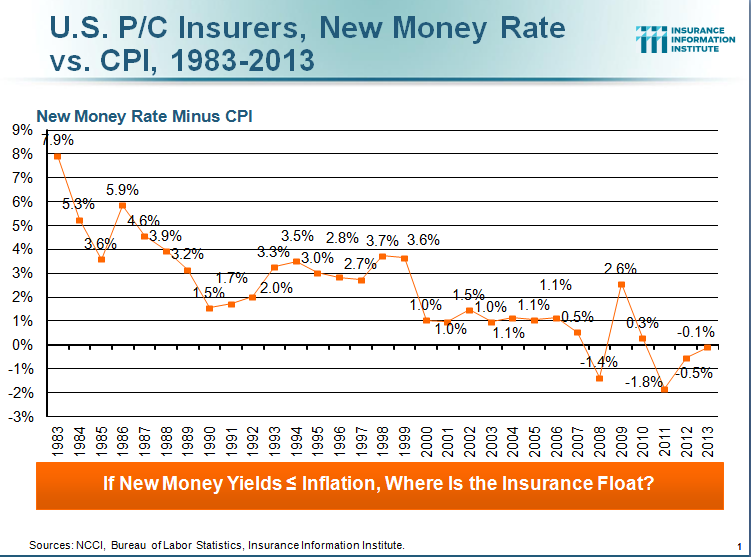 But these days float isn’t so buoyant, as you can see from the accompanying chart, which shows the net new money yield — what insurers typically obtain when they invest the float, adjusted for inflation. 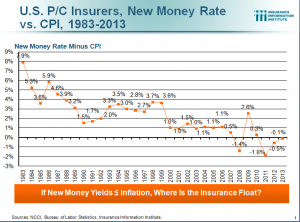 The National Council on Compensation Insurance (NCCI) estimates the yield, and we at I.I.I. made the inflation adjustment. The chart goes back decades, and it is easy to see the steady decline in yields. Thirty years ago the float yielded 5 percentage points above the inflation rate. Yields have fallen inexorably. In recent years, the float has struggled to beat inflation. The post-recession peak has been 2009, when new money yields beat inflation by 2.6 percentage points, but in four of the past six years the net new money yield was negative. Insurers differ in their investment strategy, but taken as a whole, the industry has suffered from the loss in yield. As a result, insurers have had to deliver better underwriting results in order to be as profitable as they were 10, 20 or 30 years ago. Last year the property/casualty industry wrote a combined ratio of 97, and delivered an 8.2 percent return on equity. The industry had a similar ROE in 1983 — 8.3 percent – but ran a combined ratio of 112, thanks in no small part to the tailwind provided by investment yields nearly 8 percentage points above inflation. Put another way, rates have to be about 15 percent higher today to achieve the same return as a generation ago, and that’s before considering inflation or any other changes in the marketplace. The average price of insurance for all U.S. businesses remained the same in April 2015 as it was in April 2014, according to the latest analysis from online insurance exchange MarketScout. MarketScout CEO Richard Kerr noted that the market remained flat with a zero percent increase in April 2015, down from a 1.5 percent increase in October 2014, continuing the downward trend of the last eight months. By coverage classification, rates for business owners policies (BOP), professional liability and D&O coverages decreased in April 2015 by one percent as compared to March 2015, MarketScout reported. However, commercial auto coverage actually saw a 2 percent increase, while rates for all other coverages remained the same. By account size, rates remained the same for all except jumbo accounts (over $1 million in premium) which adjusted to a rate reduction of minus 2 percent in April 2015, compared with rates the previous month, MarketScout said. A major hurricane or earthquake hitting a densely populated metropolitan area like Miami or Los Angeles will leave insurers facing losses that far exceed their estimated 100 year probable maximum loss (PML) due to highly concentrated property values, a new report suggests. In its analysis, Karen Clark & Company (KCC) notes that the PMLs that the insurance industry has been using to manage risk and rating agencies and regulators have been using to monitor solvency can give a false sense of security. For example, it says the 100 year hurricane making a direct hit on downtown Miami will cause over $250 billion insured losses today, twice the estimated 100 year PML. Instead, the report suggests new risk metrics–Characteristic Events (CEs)–could help insurers better understand their catastrophe loss potential and avoid surprise solvency-impairing events. The CE approach defines the probabilities of a mega-catastrophe event based on the hazard rather than the loss and gives a more complete picture of catastrophe loss potential. Rather than simulating many thousands of random events, the CE approach creates events using all of the scientific knowledge about the events in specific regions. This information is then used to develop events with characteristics reflecting various return periods of interest, such as 100 and 250 year, which are then floated to estimate losses at specific locations. To protect against solvency-impairing events, the report suggests insurers should monitor their exposure concentrations with additional metrics, such as the CEs and the CE to PML ratio. KCC estimates that overall U.S. insured property values increased by 9 percent from 2012 to 2014, faster than the general economy. The state with the most property value is California, followed by New York and Texas. The top 10 states account for over 50 percent of the U.S. total. U.S. vulnerability to hurricanes and other coastal hazards continues to rise because of increasing concentrations of property values along the coast. Of the $90 trillion in total U.S. property exposure, over $16 trillion is in the first tier of Gulf and Atlantic coastal counties, up from $14.5 trillion in 2012, KCC estimates. Commercial insurance rates in the United States held steady in March, according to the latest analysis from online insurance exchange MarketScout. The average property/casualty rate increase was flat or 0 percent compared to the same month last year. This compares to a slight rate increase of 1 percent in February 2015. General liability and umbrella/excess liability were down at flat or 0 percent in March from up 1 percent in February. No line of coverage reflected a rate decrease, while the largest rate increase by line of coverage was 1 percent. By account size, large accounts ($250,000 to $1 million premium) were flat as compared to up 1 percent in February. Small accounts (up to $25,000 premium) adjusted downward from up 2 percent to up 1 percent. Rates for all other accounts were unchanged. Business Insurance reports on this story here. For a broader look at the p/c insurance market, check out industry financial and results commentary from the I.I.I. Towers Watson just released its annual survey on predictive modeling with some notable results. The percentage of U.S. property/casualty executives reporting a positive impact on profitability has dramatically increased over the past six years, while the breadth and depth of predictive modeling applications has grown. Some 87 percent of property/casualty executives report that predictive modeling had a favorable impact on profitability in 2014, an increase of eight percentage points over 2013. The increase continues a pattern of growth over several years, and is up significantly from 57 percent six years ago. A positive impact on rate accuracy helps explain the boost in profits, Towers Watson said. In fact, the percentage of carriers citing a positive impact on rate accuracy has increased every year since 2010, when 70 percent cited a positive impact. By 2014, 98 percent of insurers reported that predictive modeling has improved their rate accuracy. 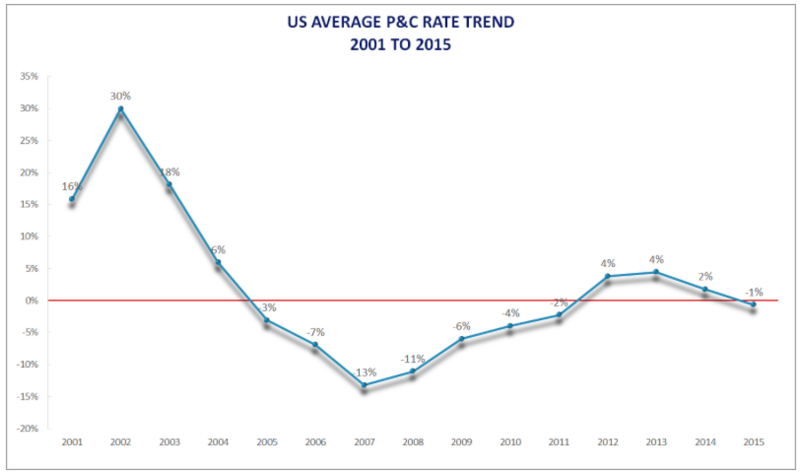 More accurate rates also positively impact loss ratios, which have improved in parallel, according to p/c insurance executives. In 2014, 91 percent cited the favorable impact of predictive modeling on loss ratios, an increase of 14 percentage points over 2013. The survey shows the use of predictive modeling in risk selection and rating/pricing has increased significantly for all lines of business over the last year, continuing a long-term trend. For personal lines, auto saw the largest increase with 97 percent of participants saying they used predictive modeling in underwriting/risk selection or rating/pricing in 2014, up from 80 percent in 2013 — a 17 percentage-point increase. Even more noteworthy is the increased use of predictive modeling in commercial lines. 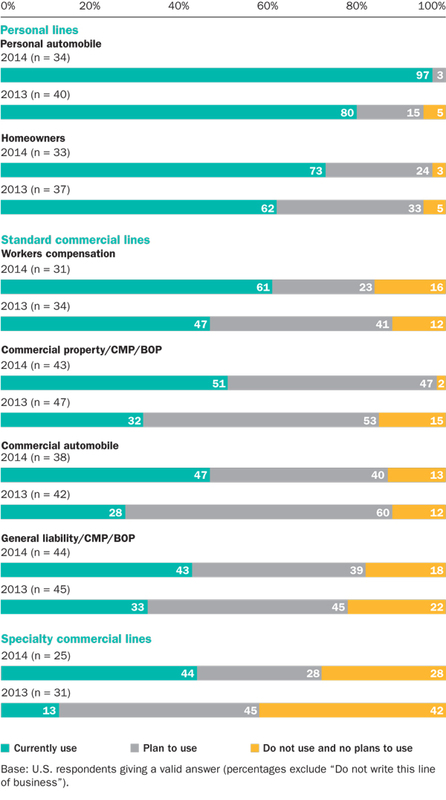 For commercial property/commercial multiperil (CMP)/business-owner peril (BOP) as well as commercial auto the use of modeling increased 19 percentage points — to 51 percent and 41 percent respectively, year-to-year. But it was specialty commercial lines that saw the largest increase, where 44 percent of p/c executives said they use predictive modeling in risk selection and rating/pricing in 2014, up from 13 percent in 2013 — a 31 percentage point increase. While the survey suggests that insurers are increasingly comfortable with predictive modeling and using it in a growing number of capacities, more progress is still possible, according to Towers Watson. Treating data as an asset and more effectively using predictive modeling applications to improve claim and other functional results could make a significant difference in the profitability of insurance companies, it suggests. More on the survey results in this Insurance Journal article. Towers Watson gauged the views of 52 U.S. insurance executives in personal lines and commercial lines carriers for the survey. The presence or lack of catastrophes is a defining event when it comes to the financial state of the U.S. property/casualty insurance industry. 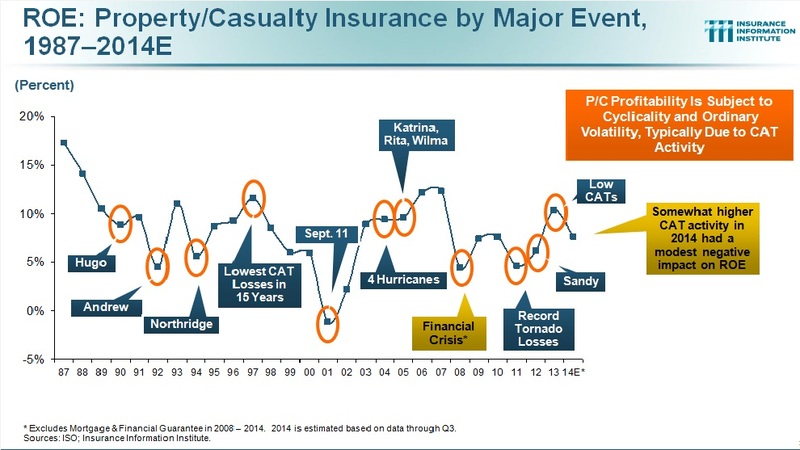 At the 2014 Natural Catastrophe Year in Review webinar hosted by Munich Re and the Insurance Information Institute (I.I.I. ), we can see just how defining the influence of catastrophes can be. U.S. property/casualty insurers had their second best year in 2014 since the financial crisis — 2013 was the best — according to estimates presented by I.I.I. president Dr. Robert Hartwig. P/C industry net income after taxes (profits) are estimated at around $50 billion in 2014, after 2013 when net income rose by 82 percent to $63.8 billion on lower catastrophe losses and capital gains. P/C profitability is subject to cyclicality and ordinary volatility, typically due to catastrophe activity, Hartwig noted. In 2014, natural catastrophe losses in the United States totaled $15.3 billion, far below the 2000 to 2013 average annual loss of $29 billion, according to Carl Hedde, head of risk accumulation, Munich Re America. Lower catastrophe losses helped p/c industry ROEs in 2013 and 2014, relative to 2011 and 2012, and helped the p/c industry finish 2014 in very strong financial shape, despite the impact of low interest rates on their investments, Dr. Hartwig noted. Overall industry capacity, as measured by policyholder surplus, is projected to have increased to $675 billion in 2014 — a record high. The industry’s overall underwriting profit in 2014 is also estimated at $5.7 billion, on a combined ratio of 97.8. Underwriting results in 2014 and 2013 were helped by generally modest catastrophe losses, a welcome respite from 2012 and 2011 when the industry felt the effects of Hurricane Sandy and record tornado losses, Dr. Hartwig noted. Matthew Sturdevant of the Hartford Courant has a good round-up of the other webinar presentations here. What a difference a year makes. Towers Watson’s most recent Commercial Lines Insurance Pricing Survey (CLIPS) shows that commercial insurance prices rose again by 3 percent in aggregate during the third quarter of 2014, drawing a line after five consecutive quarters of moderating price increases. The chart below compares the change in price level reported by carriers on policies underwritten during the third quarter of 2014 to those charged for the same coverage during the third quarter of 2013. Price increases were fairly similar to those reported one quarter ago for most lines, but continued moderation in workers compensation and some specialty lines was offset by flat pricing in property. The employment practice liability line, followed by commercial auto reported the largest price increases, Towers Watson said. Price increases for most lines fell in the low single digits. Commercial property data indicated no rate change following a slight price decrease one quarter ago. When comparing account sizes, price increases were more moderate for large and specialty accounts than small and mid-market accounts, Towers Watson added. Insurance Journal has more on this story here. For the most recent survey, data were contributed by 43 participating insurers representing approximately 20% of the U.S. commercial insurance market (excluding state workers compensation funds).